Figure 9.1, Reproduction of the original figure of Oeschger et al. (1984) demonstrating that changes in the isotopic composition of the ice in Greenland is an over-regional signal that is registered also in paleoclimafic archives several thousand kilometers farther south. The sequence of abrupt events during the last Termination - the abrupt w arming into Boiling, the Allerod cooling, the Younger 1 )ryas, and its termination - are all visible in the stable isotopes of ice from Greenland (right) and carbonates from Lake Gcracnsoc in Switzerland (from Ocschgcr et ai., ]fJ84). Since then, evidence for abrupt climate change in various paleocltmatic archives from different locations has been rapidly accumulating (e.g., Bond et al., 1992; Lehman and Keigwin, 1992; Bond et al, 1993; Grimm et al, 1993; Beh! and Kennet, 1996), Thanks to various high-resolution paleoclimatic records, the term "rapid change" can now be quantified. Dansgaard et al. (1989) and Taylor et al. (1993) have demonstrated, by analyzing the ice cores from Summit (Greenland), that the termination of YD occurred within a few decades (for the stable isotope of precipitation, a proxy for temperature) and as rapidly as a few years (for dust, an indicator for atmospheric circulation). These signals are not manifesting only regional variability in Greenland» caused, for instance* by small shifts in frontal locations; instead, they characterize large-scale climatic change of at least hemispheric extent (for comprehensive reviews see Broecker and Denton, 1989; Broecker, 1997; and Stocker and Marchal, 2000). The purpose of this chapter is to summarize briefly the current knowledge of the mechanisms leading to abrupt climate changes. They are a consequence of nonlinearities in the coupled ocean-atmosphere system and give rise to three structurally different responses to perturbations. Irreversibility can occur in the course of such changes. Its relevance for the future evolution of the climate svstem is discussed. Mikolajewicz and Maier-Reimer, 1994; Weaver and Hughes, 1994; Rahmstorf, 1995), and with low-order, coupled climate models (Stocker et aL, 1992; Wright and Stacker, 1993; Stocker and Wright, 1996; Marchal et aL, 1998a). All these models react to perturbation freshwater fluxes applied at high latitudes in the Atlantic Ocean. The response of the TIIC depends on the location and on the amplitude of the perturbation. The perturbation induces a reduction or even a collapse of the thcrmo-haline circulation. The latter is referred to as a "polar halocline catastrophe" (Bryan, 1986) and is characterized by the presence of a stable freshwater lid at the surface in high latitudes. This lid prevents water from sinking. Figure 9.3. (a) Evolution of the maximum overturning in the North Atlantic as a result of a linearly increasing melt water flux perturbation (dashed line). The thcrmo-haline circulation is weakening, initially linearly with the perturbation, but is interrupted by some significant, short-term reductions. The maximum meltwater discharge is 0.26 Sv. The thcrmo-haline circulation abruptly switches back on a few decades to centuries after the perturbation is stopped. (b) Evolution of the zonally averaged surface air temperature at 72 N as a result of changing meridional heat flux associated with the thcrmo-haline circulation. These changes are in phase with the reduction in thermohalinc overturn, (c) The brief collapses of the North Atlantic thermo-haline circulation are associated with short warmings in the south. Amplitudes do not exceed 0.5 C (from Stockcr and Wright, 1998). transient behavior is very different in the two cases. The sawtooth discharge results in gradual cooling punctuated by shorter cold spells in the north (Figure 9.3a). One such cycle looks surprisingly similar to the isotopic record of the Greenland ice core during the Bolling-Allerod-YD sequence. However, the coldest phase lasts for only a about 2000 years. Note that in this case the cooling, preceding the abrupt cold period, is not punctuated by short cold spells (except at the beginning of the first cycle). Again, warming is simulated in the south when the Atlantic THC is switched off. These two examples illustrate that the reaction of the Atlantic THC depends very strongly on the temporal history of the freshwater flux, its amplitude as well as the location. Common to both experiments is the fact that the warming is always abrupt. This is the result of a eonvective feedback bringing warm and saline waters to the surface when convection begins in high latitudes (Wright and Stocker, 1991). These water masses then lose heat very quickly (note the overshoot in surface air temperature) and so enhance convection again. This positive feedback is not operating during the gradual cooling phase of the cycle because it is caused by an advective spin-down of the circulation (Bryan, 1986). This important feature - gradual cooling and abrupt warming - is common to all 24 Dansgaard/Oeschger events during the last glacial. Similar discharge profiles can induce very different responses depending, as well, on the initia! 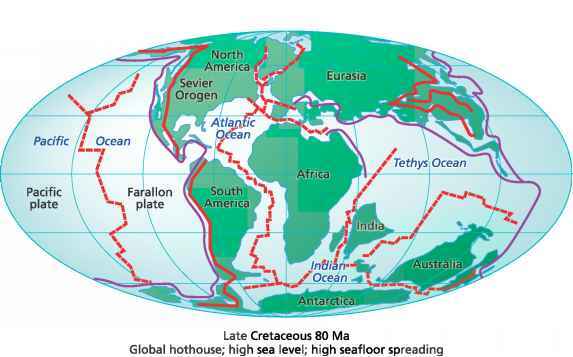 state of the circulation, This implies that for realistic paleoclimatic simulations, we would require a much more detailed knowledge of the history of déglaciation and freshwater events during the last glacial. Not only the locations but also the temporal evolution of the volumes of freshwater should be reconstructed, if at all possible. In addition to a qualitative check of the simulations of abrupt events with temperature reconstructions from ice cores, it is useful to investigate whether the simulations also reproduce other indicators of climate change. By coupling a prognostic biogeochemical component to the model (Marchai et al., 1998b), changes in the UC distribution and atmospheric COa concentration can be simulated (Marchai et al., 1998a). It is found that changes of1 'C agree qualitatively with paleoceanographic reconstructions and that a long-standing controversy about the presence or absence of NADW during NADW in the Southern Ocean can be resolved. It turns out that UC is a faithful NADW indicator only in the North Atlantic, but that farther south, other effects (gas exchange and organic matter production) strongly influence the signal. Atmospheric CO2, on the other hand, shows a small reduction at the beginning of a cold event but then increases steadily thoughout the ongoing cold event (Marchai et al., 1999). This is consistent with C02 reconstructions from an Antarctic ice core during YD. Although these results are very encouraging, it is disturbing that changes in the atmospheric concentration of radiocarbon, UC, during the termination of the last glacial have not yet been equally successfully modeled. The reconstruction clearly indicates increasing l4C at the beginning of YD, with a peak about 200 years into YD (Hughen et al., 1998), During the following 1000 years—that is, during most of YD - 14C decreases again. Model simulations, on the other hand, suggest that ,4C increases throughout YD and decreases only at the termination of YD (Mikolajewicz, 1996; Stocker and W right, 1996). This is because of a sustained, full collapse of the THC. The data, however, strongly suggest that ventilation must already have recovered soon after the beginning of YD somewhere in the ocean, either in the Southern Ocean or by way of intermediate water formation in the Atlantic. Currently, this is not simulated by the available models. •> j simplest formulation of planetary energy balance because of the dependence of albedo on surface air temperature. In the atmosphere-ocean system, nonlinearities can give rise to hysteresis behavior of the thermo-haline circulation. This is well documented b> models, The existence of multiple equilibria also has implications for the evolution of future climate. Simulations by three-dimensional, coupled atmosphere-ocean general circulation models have indicated that the THC can be reduced, or even shut off, when atmospheric COj concentrations continue to rise (Manabe and Stouffer, 1993, 1994). A thorough exploration of parameter space, however, is necessary because the global climate sensitivity (the global mean temperature increase for double CO?, A7?«_) or the evolution of future CO? increase is poorly known. Using a simplified coupled climate model, the results of Manabe and Stouffer (1994) could be reproduced, that is, the final CO? concentration in the atmosphere represents a threshold value beyond which the Atlantic THC shuts off (Figure 9.5). In addition, the rate of CO? increase, and hence the history of warming, involves threshold values (Stocker and Schmittner, 1997; Schmittner and Stocked 1999; Stouffer and Manabe, 1999), A faster CO2 increase leads to a faster warming of the surface of the ocean. Because downward mixing of heat is limited by ocean dynamics, the upper layers heat up more, and thus their density decreases correspondingly. If the density decrease is large enough, deepwater formation is reduced or inhibited altogether. For a CIO? increase of 1%/yr, typical of values in the decade 1980-90, and a climate sensitivity A 7? *- — 3.7 C as in the model of Manabe and Stouffer (1993), the Tl 1C shuts off between 650 and 700 ppm (Figure 9.ft). For current rates (about 0.5%/yr) and the most probable climate sensitivity of A7i*~ = 2.5 C, according to IFCC(19%), the critical threshold is much higher: between 1500 and 1600 ppm in this model. Based on results from many climate models and an understanding of the basic processes in the climate system, it is clearly not warranted to assume that the climate system would react in a linear fashion to perturbations irrespective of their amplitude. In particular, the dynamical coupling between atmosphere and ocean gives rise to multiple equilibria, which, in principle, imply the possibility of irreversible changes once thresholds are passed. One possibility of such a change is a shutdown of the Atlantic thermo-haline circulation as evidenced by an entire hierarchy of models. This would have profound implications for the climate in the North Atlantic region because it involves a large-scale modification of the circulation patterns and the heat balance in this ocean basin. Furthermore, it would affect the long-term uptake of CO? because NADW formation is a conduit of anthropogenic carbon into the deep sea (Joos et a!., 1999). One of the major tasks in climate modeling will be the investigation and assessment of such thresholds in the Earth System. Predicting such changes, that is, when and w hich thresholds will be crossed, is difficult, if not impossible, not primarily because of our limited understanding of the Earth System or limited computer resources but because the Earth is a truly nonlinear dynamical system (Jxirenz, 1984).